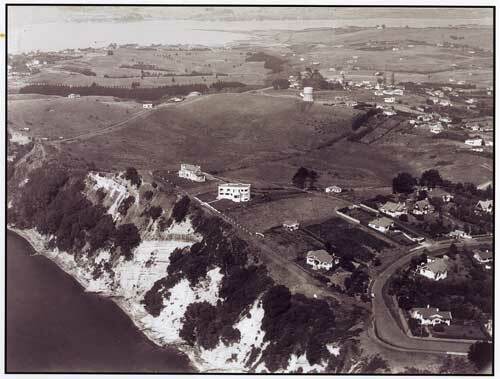 Farmland stretched all the way from Cliff Road to Tahuna Torea in 1938. The water tower dominated the area which was not going to be subdivided until after the war. By 1946 houses were beginning to extend along Riddell Road. A detail from the 1946 photo. In a detail the continuity of the beach before the Barfoot slip can be clearly seen. 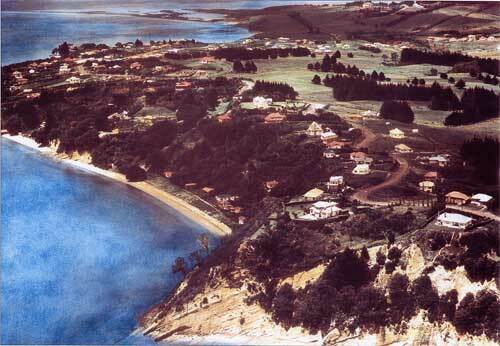 In the Bay itself the only structures were the Bampton bach, the boatshed, the Griffith house, the house which would be moved by Jeffrey Masson, the house and boatshed which would be linked together by Joan Chapple, the bach which would eventually be lost in the middle of John and Mary's houe, and the Sorenson house.